Why Do I Have Carpenter Ants in My Siding? Your home should not be a haven for pests. Even if you’re not planning to have a picnic, a sudden invasion of a large number of ants can be a shock. If you see carpenter ants moving in, out, and around your home, you’re probably worried about the structural integrity of your home. After all, carpenter ants are experts at making holes in wood, and your home is likely made of wood, at least in part. You race to save your home, but at the same time, you wonder why: why do you have carpenter ants in your siding in the first place? How Can You Tell If You Have Carpenter Ants? If you have ants in your building, do you have a carpenter ant problem? Perhaps, but not always: worker ants can move for long distances to look for food, so they may not be nesting in your building. However, ants in and around your home could be a sign of a nest close by. If winged ants come out of crevices around your home, this is a strong sign that you have a serious ant problem. If you have a serious carpenter ant problem, you may find wood shavings underneath your siding. Unlike termites, carpenter ants do not actually eat wood. They burrow into it to make their nests, so they leave behind a wood dust. If your patio or siding stays wet, this can attract carpenter ants. While you don’t want ants in your siding, carpenter ants are very valuable when they live in a forest. They turn wood into dust as they create nesting spaces. Unfortunately, if they live around your home, sometimes these nesting spaces are your siding. These ants like to live in decaying wood. Wood decays when it becomes damp. The carpenter ants get enthusiastic about this damp wood and set up a home inside it. They cut galleries into the wood to allow them to move from place to place. Since these ants enjoy wet wood, they often nest near decks, porches, eaves, and under windows. These areas are places that often experience leaks. How can you stop carpenter ants from damaging your structure? It’s simple: provide a poor living environment for them. This means that you need to keep your home as dry as possible, even on the outside. Make sure that your windows are installed properly and do not have leaks. 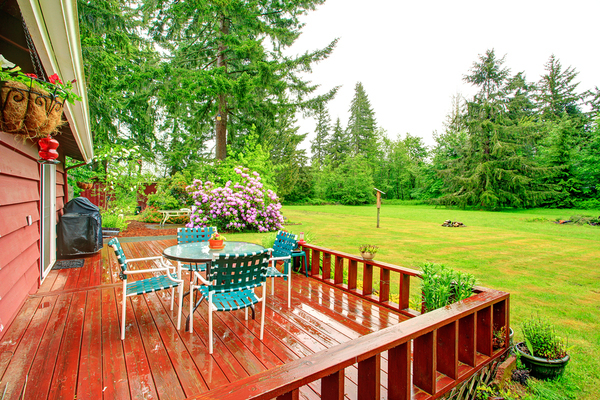 Allow water to flow or drain from decks and porches so that it does not sit on the deck and soak into the wood. Install gutter covers or do a gutter replacement project if you notice that your gutters are leaking water or that water and ice are backing up toward the roof. You want your home to be safe, secure, and pest-free. Harry Helmet shares that goal. Contact us today and learn more about our gutter replacement products that will help you reduce moisture damage to your home.